BusOnlineTicket.com has a splendid news to share with you! We are so excited to announce that Sri Theven Express has joined us to offer online booking service for their bus tickets at BusOnlineTicket.com. Check out BusOnlineTicket.com today to enjoy hassle-free online booking service for Sri Theven Express bus ticket. Sri Theven Express is one of the popular express bus company based in Selangor, Malaysia. The company runs on 30-seater express bus with air-conditioning system, spacious legroom, reclining seats and many more. The popular bus service provided by Sri Theven Express is bus from Teluk Intan to Kuala Lumpur. The bus ticket price from Teluk Intan to Kuala Lumpur costs reasonably from RM 20.00 per way. The pick up point in Teluk Intan is located at Teluk Intan Bus Station (Terminal Intan). Meanwhile, the drop off point is located at the main transportation hub in Kuala Lumpur, known as Terminal Bersepadu Selatan (TBS). 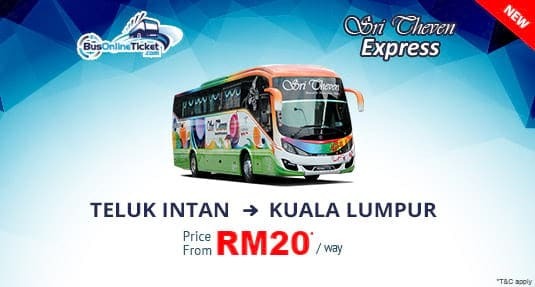 Booking Sri Theven Express bus ticket from Teluk Intan to KL via BusOnlineTicket.com is simple, convenient and reliable. We accept various payment method such as credit card, online banking including Maybank2U and CIMBClicsk, also GrabPay, Boost, Alipay and many more. All the bookings made through BusOnlineTicket.com is instantly confirmed once the payment is received.